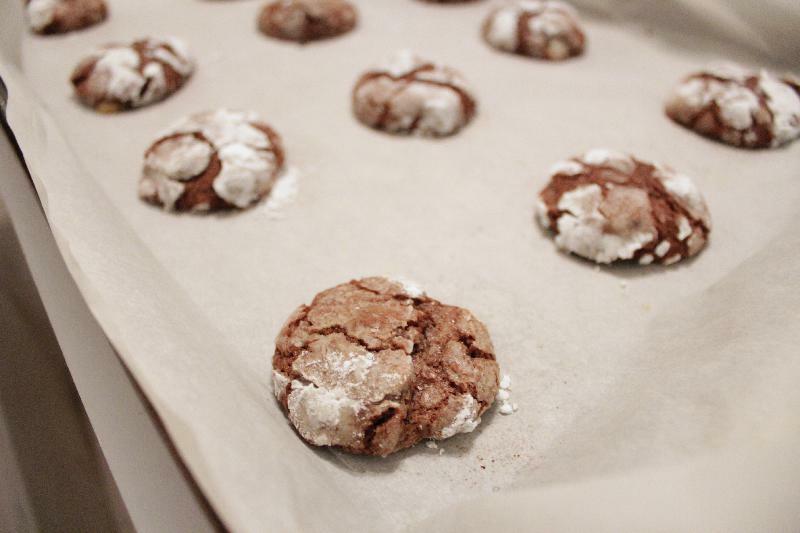 It’s December, and that means #ChristmasCookies! For the entire week, dozens of bloggers will be posting recipes from the simple to the fantastically crazy for all your cookie swap and baking ambition needs. Even better, this week is sponsored by Nielsen-Massey, which means we have a sweet giveaway! Nielsen-Massey Fine Vanillas & Flavors is giving one winner a set of their pure flavors. I got their Coffee Extract for this event, and I love it. Scroll down to enter the giveaway! And don’t forget my Easy Sugar Cookies and dozens of other fantastic #ChristmasCookies recipes! Also, this post contains Amazon affiliate links, which means that if you click on a link and then make a purchase, I make a teeny tiny commission. Thanks for supporting Bear & Bug Eats! This variation started life as a mocha peppermint cookie, but the amount of coffee extract necessary was starting to make the cookies taste like deep chocolate earth, soon just to taste like…dirt. So I backed off and let these have more of a thin mint flavor: like dark chocolate with pops of refreshing mint. I will say that I bought whatever mint chips I could find at the store, which turned out to be Guittard [<- Amazon affiliate link!]. I’m really happy with them, though–great flavor and nice and melty. If I could find these in mini, I would be over the moon, because I think the tiny-ness would be even more fun in these cookies. The other secret ingredient, the coffee extract, was provided by Nielsen-Massey [<- Amazon affiliate link!]. I requested coffee flavor not knowing what I would make, but it turns out that things like coffee extract and espresso powder are often the secret ingredient to chocolate desserts. In small amounts, they add depth without screaming COFFEE! Will these replace my beloved chocolate crinkles? I don’t know. I love those simple, cute cookies for what they are for a reason. 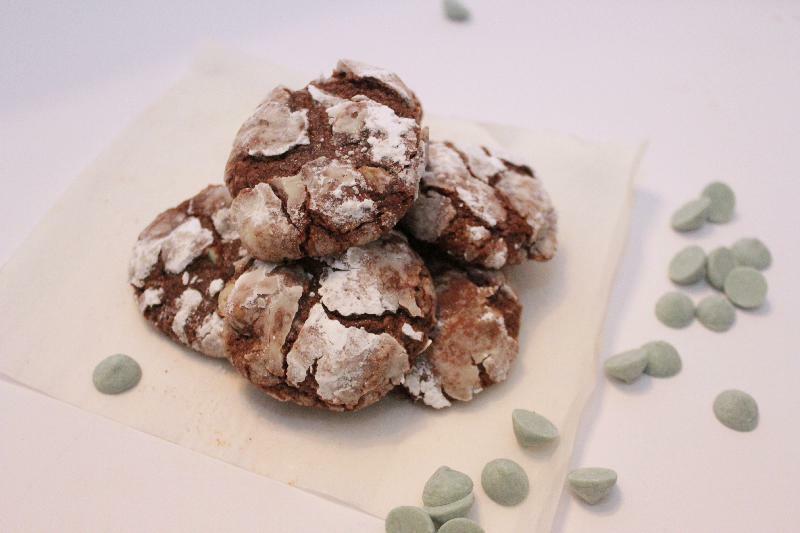 But this thin mint version is deliciously cool and chocolately, perhaps even better for cookie swaps and parties. Let’s just agree to love them both. Based on my own favorite cookie recipe. Combine oil, chocolate, and sugar. Stir in eggs one at a time, followed by coffee extract. In a separate bowl, whisk together dry ingredients. Add to wet ingredients a little at a time until dough is well mixed. Mix in mint chips. Cover dough and chill at least 2 hours. Preheat oven to 350. Cover cookie sheets with parchment paper. 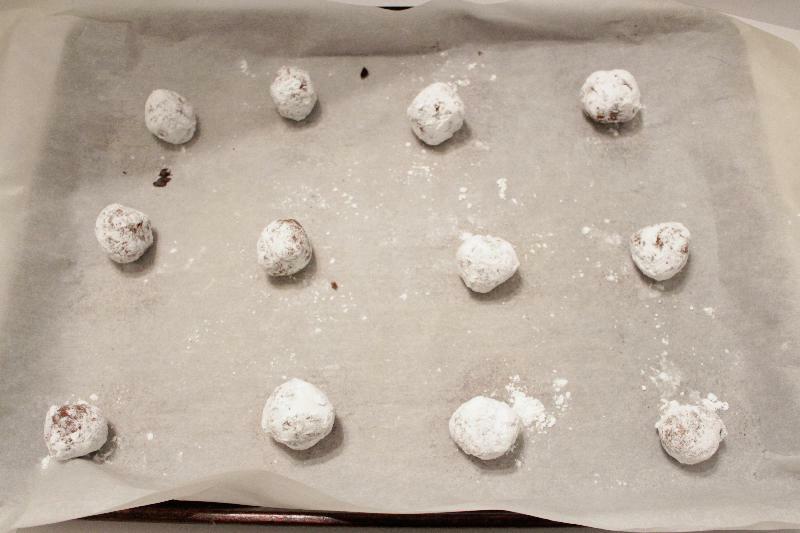 Have a separate bowl with about 1/2 cup of powdered sugar ready (add more as needed). 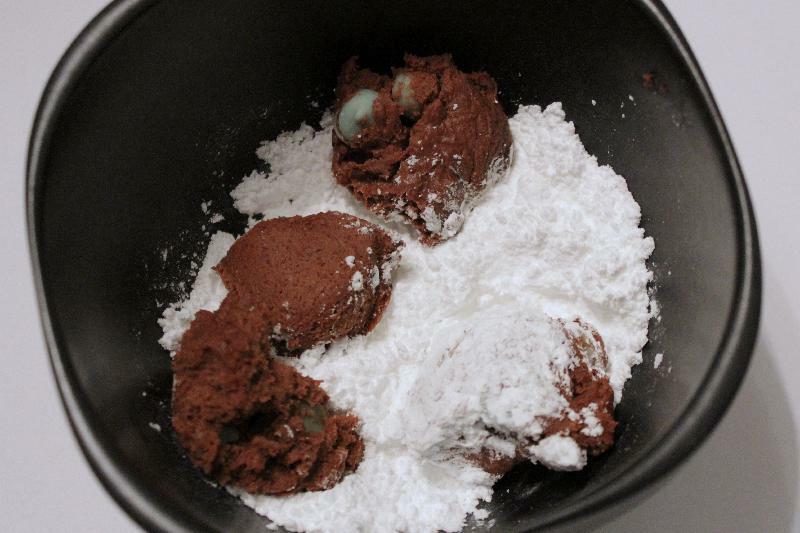 Shape tablespoons of dough, which will still be soft, into 1″ balls and roll in powdered sugar. Bake for 10-12 minutes (they’ll still appear undercooked). Allow to stand 1 minute before removing to cooling racks. Love chocolate mint and it screams Christmas to me.